Even if you haven’t seen Game of Thrones, you know the iconic, sinister saying. In the TV show, it is muttered meaningfully as a warning not only that after a long summer a harsh winter is ahead, but that winter brings with it an existential threat to the world—an army of the dead. This threat makes all the vicious scheming, treachery and feuding look insignificant and petty. As a human rights defender watching leaders around the world scapegoating and dividing to score political points, I can’t help thinking that winter may be coming for all of us—a dark future where protection of human rights won’t mean much anymore. This unprecedented commitment to protect human rights everywhere was made by the survivors of a long night of horror that humanity had just endured. They joined forces to ensure that the gas chambers, the extermination of the entire peoples, and the suffering of civilian population at such scale never happen again. Since then, people around the world have claimed remarkable victories: securing rights for women and LGBT communities, standing up to abusive governments, removing seemingly indestructible totalitarian regimes and bringing heads of states to account. People have created a society that would be unrecognizable to those who emerged from the darkest moments in human history determined that it should never be repeated. Yet now it seems that we are going back in time. I have no illusions that the past 70 years were rosy. We human rights defenders have been like the brothers of the Night’s Watch, a bit closer to the chilly winds, warning, sounding the alarm and guarding against the worst abuses. The basic principle that kept the winds of winter at bay, that all governments must respect certain universal rights, has never felt more threatened than it does today. The inhabitants of Westeros may act as if summer will last for ever, but we cannot afford to do the same. We are no longer fending off attacks on the rights of individuals or communities. We are no longer dealing with a few rogue governments while relying on others as allies. We are up against the assault on the entire system of human rights protection. Like Jon Snow, we must rally everyone together for our own existential fight. This creeping assault did not start yesterday. Within just a few recent years, xenophobia, misogyny, and dehumanisation of “others” have become the slogans that brought victories to politicians who blatantly exploited their electorates’ sense of insecurity and disenfranchisement. But not only that, it has increasingly become a call for action, leading to discrimination, hate crimes, violence and deaths, as we have just seen in Charlottesville. Vaguely defined “security concerns” are being used as justification for deviation from human rights, such as the prohibitions of torture and summary executions, in countries as different as the United States, Russia, Egypt, Nigeria, Turkey, and the Philippines. States like Russia and China, which have consistently challenged the very notion of universality of human rights, have become emboldened and manage to increasingly dominate or stall the debate at the international level. What is worse, countries like the United States or the United Kingdom, who have been, at least in rhetoric, the champions of human rights, have dramatically changed their positions. Like Cersei Lannister, they unashamedly pursue narrow self-interests, and in doing so pedal despicable arguments that human rights should be sacrificed for national interest. Their position makes it all too easy for other states, with less established traditions of democracy and respect for human rights, to follow this path. There is no denying it – the system of human rights protection built in the aftermath of some of darkest times in modern history, is descending into the dusk again. And, to use another sinister Game of Thrones quote, the night, when it comes, will be “dark and full or terrors.” Anyone who hopes to stay untouched by being far from the frontlines of this battle, has simply forgotten the previous “winters” too quickly. The only way to protect our core common human values against such powerful forces, is to unite and act: to resist the attempts to divide us along any lines; to bring our own governments to account—to speak out, loudly and persistently, using all available means of communication, from megaphones to social media, against assault on our rights and the rights of others; to open our hearts and homes to those in need of protection; and to show our support and solidarity with every individual or community facing injustice or persecution. In the world of Game of Thrones, a long, cold winter is quickly descending. But for human rights it does not have to be that way. If together we keep the candle of the human rights protection alight, darkness will retreat. When the Human Rights Council has acted with clarity and integrity, it has advanced the cause of human rights. It has brought the names of prisoners of conscience to international prominence and given voice to the voiceless. At times, the Council has placed a spotlight on individual country violators and spurred action, including convening emergency sessions to address the war crimes being committed by the Assad regime in Syria. The Council’s Commission of Inquiry on North Korea led to the Security Council action on human rights abuses there. The Council is at its best when it is calling out human rights violators and abuses, and provoking positive action. It changes lives. It pushes back against the tide of cynicism that is building in our world. And it reassures us that it deserves our continued investment of time and treasure. But there is a truth that must be acknowledged by anyone who cares about human rights: When the Council fails to act properly – when it fails to act at all – it undermines its own credibility and the cause of human rights. ……These problems were supposed to have been fixed when the new Council was formed. Sadly, the case against the Human Rights Council today looks an awful lot like the case against the discredited Human Rights Commission over a decade ago. Once again, over half the current member countries fail to meet basic human rights standards as measured by Freedom House. Countries like Venezuela, Cuba, China, Burundi, and Saudi Arabia occupy positions that obligate them to, in the words of the resolution that created the Human Rights Council, “uphold the highest standards” of human rights. They clearly do not uphold those highest standards. This is a cause that is bigger than any one organization. If the Human Rights Council is going to be an organization we entrust to protect and promote human rights, it must change. If it fails to change, then we must pursue the advancement of human rights outside of the Council.America does not seek to leave the Human Rights Council. We seek to reestablish the Council’s legitimacy. There are a couple of critically necessary changes. First, the UN must act to keep the worst human rights abusers from obtaining seats on the Council. As it stands, elections for membership to the Council are over before the voting even begins. Regional blocs nominate slates of pre-determined candidates that never face any competition for votes……Selection of members must occur out in the open for all to see. The secret ballot must be replaced with open voting. Countries that are willing to support human rights violators to serve on the Human Rights Council must be willing to show their faces. They know who they are. It’s time for the world to know who they are. Second, the Council’s Agenda Item Seven must be removed. This, of course, is the scandalous provision that singles out Israel for automatic criticism. There is no legitimate human rights reason for this agenda item to exist….Since its creation, the Council has passed more than 70 resolutions targeting Israel. It has passed just seven on Iran. ….Getting rid of Agenda Item Seven would not give Israel preferential treatment. Claims against Israel could still be brought under Agenda Item Four, just as claims can be brought there against any other country. Rather, removal of Item Seven would put all countries on equal footing. 2017 (4): Canada’s year of real human rights action? Alex Neve and Beatrice Vaugrante (Amnesty International Canada) wrote in the Ottawa Citizen (23 January 2017) a piece entitled: “Why 2017 must be Canada’s year of human rights action”. The need is certainly great….a deeply troubling current of populism, racism, xenophobia and misogyny that has dominated election and referendum campaigns in numerous countries, most notoriously in the United States. The world collectively holds its breath in worried apprehension about the human rights implications of Trump’s presidency. And what of Canada? Important Canadian government policy changes last year point to a renewed commitment to human rights; not consistently, but certainly sorely needed after years of diminished world standing. That is particularly so when it comes to gender equality, refugee protection and diversity. We have significantly re-engaged with the UN human rights system, including support for institutions that we once helped established, such as the International Criminal Court. On the home front, the government’s talk of a new relationship with Indigenous peoples is welcome. It has laid the ground for the long-overdue National Inquiry into Missing and Murdered Indigenous Women and Girls, which faces challenges and misgivings but is nonetheless underway. However, it is disappointingly evident that inspirational words and gestures are not translating into the concrete measures needed to truly address the decades of human rights abuse at the heart of Canada’s legacy of colonialism. Nowhere is that more obvious than when major resource development projects – be it pipelines, mines or hydroelectricity – are at stake. This is well-evidenced in the continued federal support for British Columbia’s Site C Dam despite a scathing environmental impact assessment, vocal opposition from First Nations, and the government’s own acknowledgement that its Treaty obligations have been sidelined. ….. It adds up to a year of considerable human rights responsibility and expectation for Canada. Responsibility: to make sure that 2017 is a turning point for Indigenous rights in Canada. No more excuses. Governments, institutions and Canadian society more broadly must sincerely commit to profound action to ensure that violations against Indigenous peoples will at long last be brought to an end and justice done for those who have borne the burden of this terrible history. Expectation: to stand up for human rights around the world. There will be much pressure on Prime Minister Justin Trudeau to appease new counterparts, south of the border and elsewhere, who have come to power having fuelled discrimination and division. But there can be no room to waiver. Respect for human rights must be at the heart of what Canada seeks to advance around the world, as never before. 2017 must be a year for human rights. Alex Neve is Secretary General of Amnesty International Canada’s English Branch. Béatrice Vaugrante is Director General of Amnesty International Canada’s Francophone Branch. 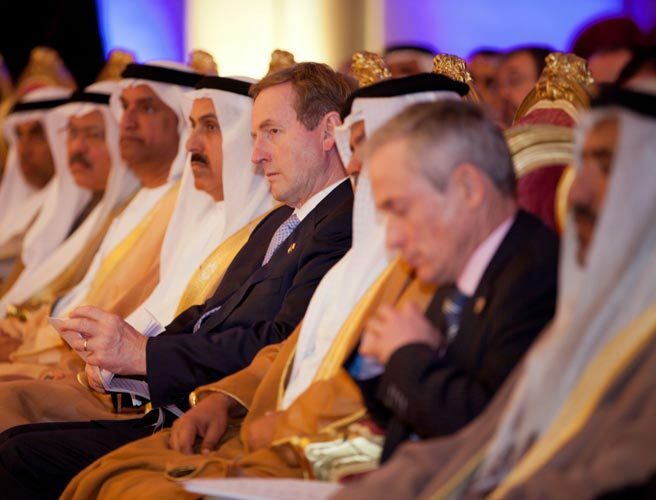 Amnesty Ireland has voiced serious concern about the government’s failure to raise human rights issues during its trade mission to the Middle East. The group wrote to the Prime Minister and the Minister for Jobs to ask if it is now part of our foreign policy to allow trade issues to trump the government’s human rights commitments, sending a copy of its report from November 2013 which details abuses of the rights of migrant workers in Qatar. Rule of law, freedom of the press, women’s rights – these were just a few of the issues recently discussed at a conference which brought together human rights defenders from Central America and the Caribbean. Twenty human rights defenders from 13 countries and representatives from the German embassies attended the event, which took place from 17 to 18 April in Panama and was organized by the Federal Foreign Office. Also participating were the Federal Government Commissioner for Human Rights Policy and Humanitarian Aid at the Federal Foreign Office, Markus Löning, and the Regional Director for Latin America and the Caribbean, Thomas Karl Neisinger. The discussions were dominated by the key issues affecting the region, such as the rule of law and women’s rights. Special attention was given to the subject of coöperation between embassies and human rights defenders as well as building networks and strengthening regional civil society. Despite the different situations in countries such as Honduras, Costa Rica and Jamaica, many states in the region face similar challenges. Consequently it is especially important to improve civil society networks so that human rights defenders can learn from one another’s experiences and coöperate more closely in the future. This event was the fourth regional human rights seminar organized by the Federal Foreign Office. This format is to be retained for future events, for example in Southern Africa in June 2013. Auswärtiges Amt – Latin America – Better networks for human rights.